Persistent breakouts damaging your skin? You may have chronic acne, which is more common than you may realize. There is a common misconception about chronic acne in that some people think if they’ve had it for more than 2 years, it may not be chronic. Or if they have a mild case of acne, yet they’ve had it for over 2 years, then it’s a less severe case. Both of these cases are wrong! Chronic acne is typically meant to refer to anyone who has had acne symptoms for atleast over 2 years. This type of acne is usually just as difficult to treat as adult, or hormonal acne, which are caused by the always fluctuating hormonal levels that are known to affect the production of oil. While chronic acne may be difficult to treat, it isn’t impossible. With a few tips, tricks, and rules to live by, you can learn to work with your chronic acne, and find some relief along your journey toward clear and healthy skin. 1. Stay Alert. When it comes to treating acne, prevention is key. You can take steps to put a stop to chronic acne before it becomes incessant, leading to frequent breakouts, and possibly resulting in scars. If your acne is mild, or if your notice it fluctuating at certain times, do your best to make note. Are you noticing breakouts just before your period? After you eat dairy? Just before a major seasonal change? If you can spot what’s triggering your pimples you can take appropriate measures to possibly avoid them the next time around. 2. Stay Smart. Like any type of acne, chronic acne begins from within, and starts forming weeks before you see a breakout on the surface of your skin. In order to truly stop acne you must address it at its source - the sebaceous glands. AcnEase works to do just this. Using safe and effective herbal ingredients, AcnEase works to create a buffer between the hormones and sebaceous glands, assuring that only the amount of sebum needed to hydrate and protect the skin is produced - no more, no less. 3. Stay Vigilant. Once you have found a solution that works for you, your lifestyle, and your skin, it is important to stay on top of your treatment, and never wait for symptoms to appear before attacking your acne. A combination therapy approach of both systemic and topical treatments is the best bet for treating any type of acne, as pimples are formed when excess sebum combines with dead skin cells within the pore to form bacteria. It’s an inside, and outside job, and once you find a solution that works for you, keeping up with your skincare routine will run like clockwork. When you properly treat acne from within, you can spend less time worrying about pimples on the surface. 4. Stay Patient. We realize that this one is easier said than done, but patience is key in order to experience real relief from acne. It’s an unfortunate yet true fact that the longer you have acne, the longer you will have to treat it, so it’s important to never give up, and when you find something that works - don’t stop! Both you and your skin deserve to be as healthy as possible, so a change or habit created with maintaining clear skin in mind is a form of self-care that will show from the outside. 5. Stay open-minded. 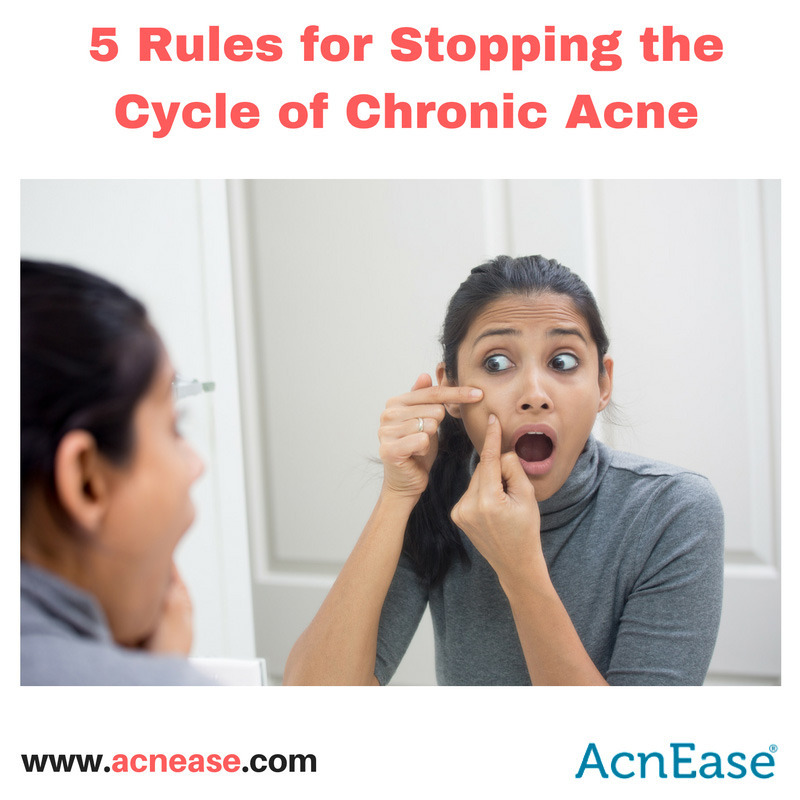 Chronic acne, as with all chronic ailments, may be difficult to end and control, and might require a few tries and tweaks before you find a fit that works for you. You might even need to change up that routine after a little while, because like anything, our bodies and environments are always changing. Keeping an attitude of open-mindedness will help you go with the flow and remember, especially when times are tough, that this too shall pass, as long as we do what we need to take care of ourselves in the moment. As mentioned earlier, finding a combination of treatments to address the inner and outer issues of the disease will be your best bet. AcnEase combined with a topical wash and non-comedogenic moisturizer are a great place to start. If your severe acne is in need of more help, you may want to consider a dermatologist who can prescribe a topical antibiotic or medicated treatment to add to your combination regimen. The important thing is that you find what works for you. 96% of AcnEase users say that AcnEase works for them. We hope you’re next! We want to hear from you! What do you do to treat your chronic acne? Have any tips for keeping your breakouts to a minimum? Tell us in the comments!